The wild type is a short-lived perennial, a somewhat untidy plant with blue flowers. To 60cm. It is mostly grown as an annual, with most cultivars being compact, mound-forming plants, 15-30cm tall, with numerous small, rounded flower clusters in shades of blue, red and white in summer. [RHSE, Hortus]. Introduced to Europe in the early nineteenth century. 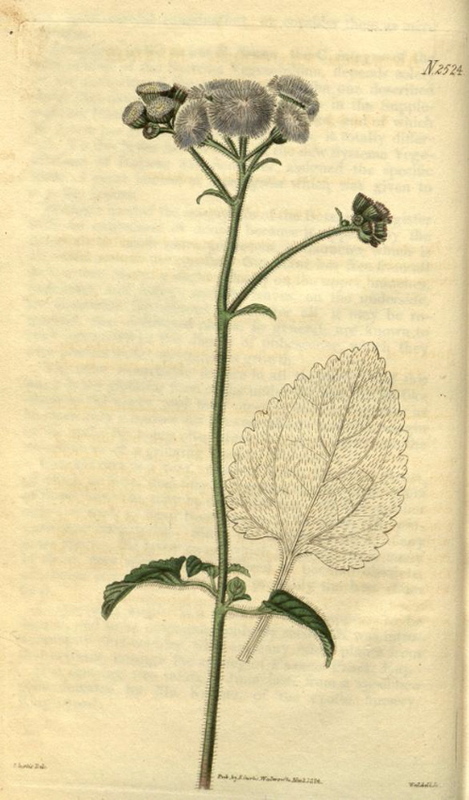 Johnson's Dictionary gives a date of 1800 for A. caeruleum and 1822 for A. mexicanum. Ageratum mexicanum was raised by Mr. Tate of the Sloane Street nursery from seeds brought from Mexico by Mr. Bullock. [BM t.2524/1824]. 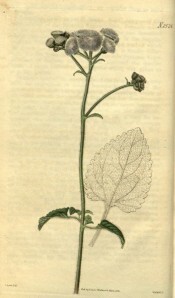 A. mexicanum was recommended as a useful winter greenhouse plant in The Gardeners Chronicle. [Gard. Chron. 1854]. Listed in the 1850 and 1857 catalogues [H.3/1850]. Ageratum houstonianum is well established as a weed in parts of Australia and interestingly grows wild throughout the site of John Bidwill’s garden at Tinana. Ageratum caeruleum Hort. ex Poir. = Ageratum conyzoides L., synonym Eupatorium conyzoides (L.) E.H.L.Krause, a closely related plant.